With school starting back up this past week, and fall right around the corner, it is time for me to start getting out the long sleeve pants and shirts. At the end of each season I pack away the clothes into Rubbermaid containers to save for the following year and store them on a shelf in the garage. Knowing that we would have a couple of days in the 60’s this week I took the fall clothes out and started to sift through them to see what was needed this year. Trevor was mainly needing pants, while Jonathan was needing a whole new wardrobe as none of his clothes from last year fit. 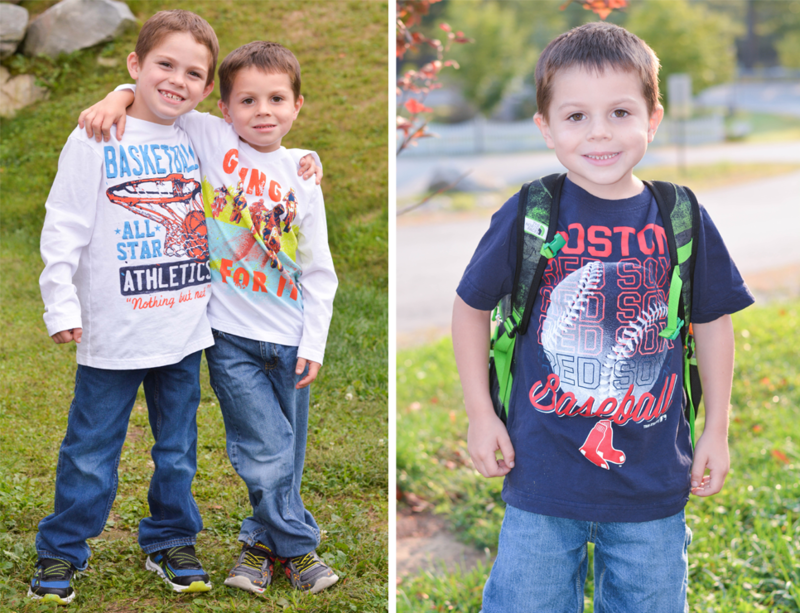 Both boys grow so quick and are adventurous, so I hate to spend a lot of money on pants and shirts. After signing up for the special offers from The Children’s Place and receiving a 25% off coupon, I was surprised to see how much I could score for just $60, not to mention free shipping as well. 7 shirts, 2 jeans, 2 pajamas, and 3 pairs of socks. You can’t beat jeans for $5.85, and t-shirts for $3.94. Jonathan and Trevor had a fun time shopping online for new school apparel, it was hard to narrow down their choices as there were so many fun shirts available. As you can tell, Jonathan is a big sports fan, with soccer, baseball, and basketball shirts. The Red Sox shirt for only $6.36 was a steal, it’s so hard to find team apparel under $15. Don’t miss out on the awesome back-to-school sales at The Children’s Place. Sign Up & Save 25%: Sign up for special offers and news from The Children’s Place and receive a coupon for 25% off your first in-store or online purchase. I love shopping at Children’s Place for my grandsons. I can always find cute stuff and they are good quality clothes. Thanks fo the link, I marked 5 outfits for Alysia to choose from!